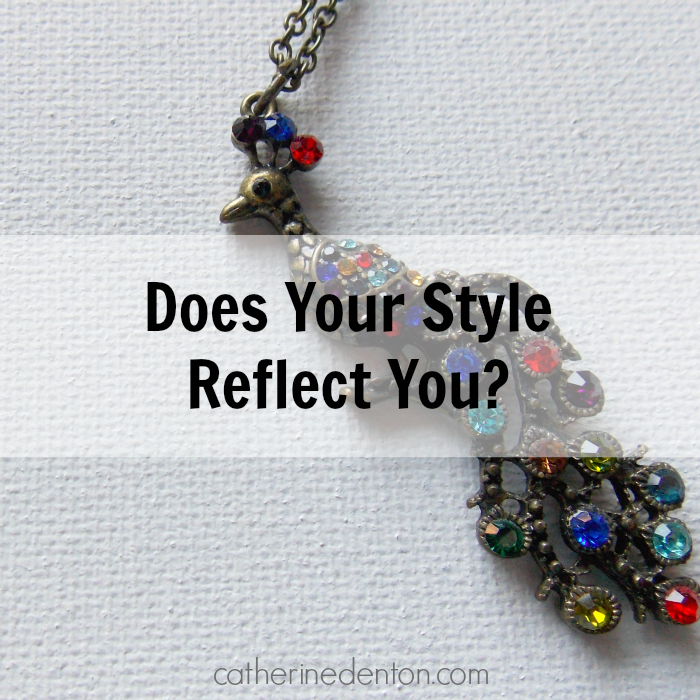 Catherine Denton: Does Your Style Reflect YOU? If your style does not reflect you, it will make versatility in your wardrobe difficult. No one likes to mix and match clothing items that aren't authentically them. For example, those items that someone else bought you, or a trend you thought you'd like but didn't ~ all these items need to go. Does it reflect your Soul? By soul, I mean the deepest part of you: your motivations, your values, what you love. Does it reflect who you are? It doesn't have to tell everything about you but it does need to represent you. For instance, I love for people to feel welcome around me so my style is pretty approachable. I don't look like an icon; I look more like street style. Keep in mind that your style is not the same as fashion. Style is a more about the longevity of a piece ~ something that won't be awkward to wear next season. Trends are something that come and go, but style is long-lasting. You want your style to reflect your persona. You want people to be able to look at you and see a snapshot of who you are and what your purpose is. You want your style to hint at your inner workings, and the things that make you especially you. If you're a counselor, a listener, an artist, a lawyer, love the spotlight, love the background ~ all of these things should be reflected in your wardrobe and your style. In fact, they probably already are, you may've just not noticed. Let me give some examples. Lady Gaga's style reflects what she stands for ~ she likes to make a statement and be in the spotlight. Obviously this is her "brand" as well since she is a celebrity musician, but she's a good exaggerated example. Jennifer Anniston is another example. Her style is definitely more subdued. She rocks a simple wardrobe of tank top, jacket and pants. It doesn't scream "look at me", but it does get your attention. Her simplicity points to the person instead of fashion. Her outfits reflect a no-nonsense, competent, business woman. Audrey Hepburn is probably my favorite style icon. Her style was cute as well as stunning. She was approachable but glamorous. She mostly wore all black, modest yet figure-fitting styles. She sent the message of having depth but also not taking herself too seriously. You want to seriously consider if your style reflects you. Does it show your motivations, values, and what is meaningful to you? Is it full of soft fabrics, casual styles, comfortable lines? Or full of durable fabrics, business styles and conservative lines? Can you picture how those things would send your message? I'm not a wearer of high heels because it scares me. I'm a little uncoordinated and a bit clumsy so I shy away from heels. You would never walk into a shoe store, see a pair of high heels and think, "Oh that looks like Catherine". No. But you might see a striped shirt or cardigan and think of me because I like classic cuts and love stripes. Be sure the message your style is sending, is the message you WANT to send. I believe a small wardrobe full of style that tells a little of our story is worth much more than a huge closet full of passing trends. What do you want your style to reflect about you? Very good questions. I want my style to say that I am fun, approachable and kind. How on says those things with an outfit is a bit of a mystery to me, but an interesting concept to think about. I think separating personal style from trend is a really important point. It's important to be able to have that sort of perspective for a filter when looking in shops. I didn't really understand my style well until I cut my wardrobe down to the barest of essentials - I have much less clothing but I love all of it. Hannelene, I found the same to be true when I reduced mine! I suppose being choosey brings clarity. I agree Michelle! Mine has changed through the years as well. I think it has to do with the seasons of our life and what we're pursuing. I really like the words you used to describe your wardrobe, it sounds lovely!